To make the cake batter, follow the directions on the back of the Betty Crocker Super Moist™ Lemon cake, adding the water, oil and eggs as directed. Bake in two round, greased cake pans, remove from pans as directed, and cool completely. To make the frosting, beat the butter and sugar on high until light and fluffy. Add the lemon juice and gin, and continue to beat on high for another 10 minutes. Frost cooled cake, and garnish with lemon slices or peel as desired. Try this cake for guests – they'll never know how easy it was! Attention lemon lovers: This cake is for you. I have to admit, I've made almost every single Betty Crocker cake, and this one definitely takes...the cake. It's incredibly moist, like almost sinfully so, because the lemon flavor is just right and you cant stop eating it. If you're in a hurry and want an insanely delicious dessert to serve, this cake is hassle-free and will be an absolute hit at your next gathering! 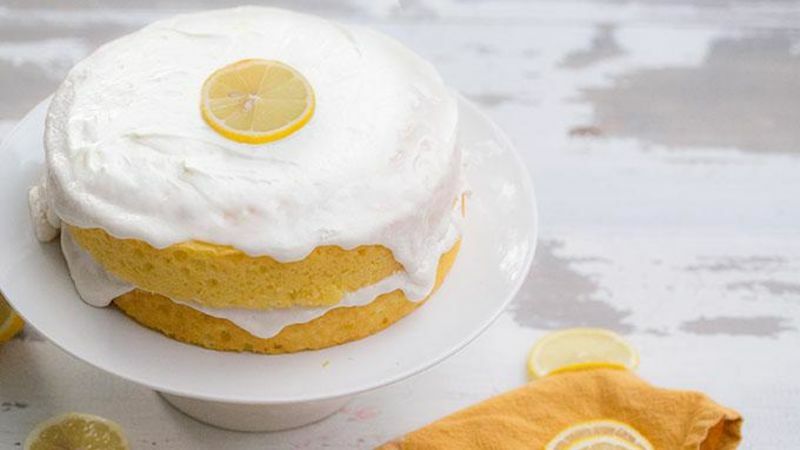 Since we have a crazy lemon tree outside that produces way too many lemons to keep up with, I decided to make a boozy lemon and gin icing that goes perfectly with this cake. The gin and lemon pair quite well together, reminding you of a Gin Sour cocktail, adding a refreshingly sophisticated top to your moist lemon cake. Garnish with lemon as desired. Slice and serve ... and enjoy!